On our last day in Austin for PaleoFX (which, by the way was AWESOME – I recommend Nom Nom Paleo’s coverage if you missed it!) my lovely roommate (Lea of PaleoSpirit) and I had the TV on as we were getting ready to head into Austin for the day. All of a sudden we started hearing about how statins were bad and cholesterol and saturated fat weren’t the worst things in the world. Um, what?! So of course we took a seat and watched. Of course now I can’t find a YouTube video with the interview, but I’m sure it’ll come around soon. I’ll post it as soon as I find it. In the meantime, you can check out this article in which Dr. Lundell talks about his beliefs. He also talked about staying away from n-6 fatty acids and focusing more on saturated fats. No mention of grains either way, but hey – that’s pretty good for being on Fox News. This is EXACTLY what we need right now to get this movement into the eyes of the general public -a super-qualified medical doctor touting it on Fox News. Perfect. The amazing thing is that was the second time in one week I saw him interviewed on Fox News. Not to mention Rush Limbaugh reading extensively from Dr. Lundell’s article recently to his millions of listeners. Word is getting out to the masses slowly but surely. So many people will be able to benefit from this information. 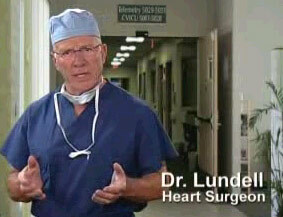 The fact that Lundell is a highly qualified M.D. just make him even more credible to people who are afraid NOT to follow the USDA recommendations. I know, Lea. It’s awesome! To everyone else: if you haven’t seen Lea’s post about her calling into the Rush Limbaugh show, it’s great. Check it out here.